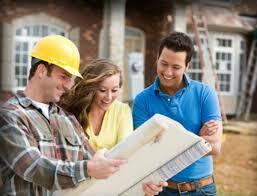 Selecting the right home addition contractor for your home construction project can be challenging. Home addition contractors as a whole are very self assured and confident, and typically give the appearance that they know everything there is to know about the residential building market, even though they often do not. For the neophyte homeowner who has not worked with home addition contractors before, they can quickly become enamored and lulled in by the confident and fast talking residential building contractor looking to close a deal. The old proverb that “if it is too good to be true it probably isn’t” should be constantly rehearsed in the homeowner’s mind prior to meeting with any prospective home addition contractor. In addition, the homeowner should have a list of questions assembled prior to meeting with the prospective home addition contractor. At the top of the list should be how long as the contractor been in business and is he or she licensed. The home addition contractor should be able to produce a copy of their state contractor’s license and hopefully some type of portfolio of the projects they have completed over the years they’ve been in business. In addition, they should include a list of references that you can call. Also important is to understand the home addition contractor’s work habits and payment expectations. The more written information they provide that backs up their statements on work habits and payment expectations the more confidence you can have with their answers. When choosing a home addition contractor it’s important to do your homework after interviewing a candidate. Make sure to call the state to confirm their contractor license is valid and that there are no outstanding legal issues or complaints with them. In addition, check with the Better Business Bureau to see how they rank and again to find out if there are any complaints against them. Also make sure to check the references. Though the references maybe somewhat biased, often you can glean information from them that may be constructive on how to work and deal with the prospective home addition contractor. I also advise to check older references as well as the newer ones. Older references may be a bit more open with you. In addition, you can get a better handle of how well the contractor’s work has held up over the years. In regards to finding home addition contractors you have a number of resources at your disposal. First, you can check with friends and family who may have worked with one recently. Second you can look in your local phone book, however this is like shooting in the dark as there is no initial screening/reference when simply calling a number out of the phone book. Probably the best method for finding a contractor is to use one of the national contractor database services, such as through Quinstreet or RenovationExperts. These companies have large national databases of contractors that they have done their due diligence on. To be included in one of these national databases each contractor has to go through a thorough background check to make sure that they are truly a licensed and reputable contractor professional. To use one of these company services is free to you. Simply fill out one of their online forms (See “Find Home Addition Contractor Form”), and 3 to 4 local contractors will contact you to schedule a meeting with you to discuss your project. There is no commitment required of the homeowner to use any of the contractors. 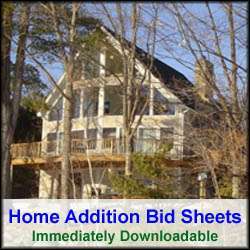 Another part of the selection process is to carefully review prospective home addition contractor bids for your project. Pay close attention to the level of detail in the bids. In general the more detailed a bid is the better it is. A detailed bid shows the contractor has considered all of the issues associated with the project. Make sure it includes a detailed schedule and bill of materials, a budget, payment milestones, and a description of what work will be done and by whom. Also make sure the bid discuses how change orders will be handled. With these key items considered when choosing a home addition contractor your chances of a successful home addition project are dramatically improved.